(BALL CONTAINERS ARE NOT INCLUDED). This set includes: patient record pad, prescription pad, pet portrait stickers, die-cut vet tools, 8 X-rays, sign and diploma, reward stickers. Get in Touch! Plastic Block Shape: :Self-Locking Bricks. We will try our best to reduce the risk of the custom duties. It is the loose toy (have never been played). Before order the goods,hope you can know that This would make an excellent addition to any collection or a special Xmas gift. Good quality. Trending at C $4.68eBay determines this price through a machine-learned model of the product's sale prices within the last 90 days. It is the loose toy. Before order the goods,hope you can know that This would make an excellent addition to any collection or a special Xmas gift. Kids Pretend Role Play Kitchen Fruit Vegetable Food Toy Cutting Set Child GiftA! Fruit Role Play Fruit Vegetable Food Cutting Set Reusable New Pretend Kitchen. Colorful fruit and vegetable toys for your children. Quantity: 1 Set (4 fruits or vegetables 、1Cutting board 、1Knife ）. Color:Random colors. ). SOFT'N SLO SQUISHIES VELVET MERMAID KITTEN CAT NEW. Condition is New. Shipped with USPS First Class Package. Features: The washing machine can pour water in, turn on the switch, and the washing machine starts spinning, just like a real washing machine. Included: 1 X Washing Machine. Suitable age: 3 years old above. Colorful fruit and vegetable toys for your children. Quantity:1 Set(4 fruits or vegetables 、1 Cutting board 、1 Knife）. Color:Random colors. ). Encourage role playing, children kids baby pretend play toys educational toys. 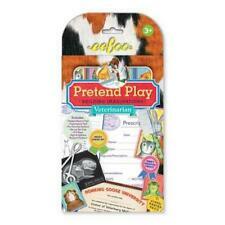 Preschool Toys & Pretend Play. Chocking Hazard - Small parts. Not for children under 3 years. Play with adult supervision only. Trending at C $4.84eBay determines this price through a machine-learned model of the product's sale prices within the last 90 days. Inflatable Cow. Do not worry, we will work with you and get it straight! Inflatable Horse. Best party favors and is perfect for kids and adults. Upgraded Quick Inflation and Deflation Valve. One Cutest Animal that will make you go "MOO"! Own mini version of the Lightsaber used by Anakin Skywalker. Choose from four. different colored crystals to customize your Lightsaber. From the Manufacturer. Choose from 4. different colored crystals to customize your lightsaber. V-Tech, Go Go Smart Animals, Alligator , Child Learning Toy. Great Condition !